On a wet Sunday in May, a group of veteran motoring enthusiasts met at the National Motor Museum at Birdwood to celebrate a very important birthday. 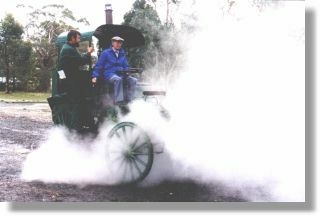 The Shearer Steam carriage, arguably Australia's oldest motor vehicle, was 100 years old. Built at Mannum on the banks of the Murray River in South Australia, the Shearer first appeared in public there on June 5th, 1899. It was used only for a year or two, with the engine being transplanted into paddle launch named "The Keith" around 1903. Surviving against the odds, the vehicle was cosmetically restored in the 1960s, and donated to the state of South Australia in 1975. Members of the Sporting Car Club of South Australia completed a full restoration in time for the 1984 National Rally. 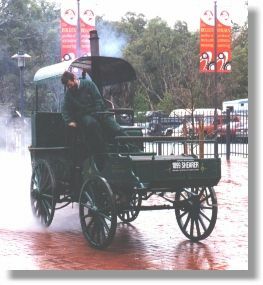 The rain at Birdwood didn't stop the Shearer from taking a lap of the museum grounds, nor did it spoil the brief celebration ceremony, attended by Peter Shearer and Mary Bidstup, grandchildren of the original builder. As for the bikes and cars that attended on the day... well the intentions were good! We had planned a spin around the hills, but sadly the rain hardly let up during the day, and riders, drivers, passengers and visitors enjoyed the festivities, a nice chat and a wander around the museum. Not to mention the birthday cake! Bikes attending on the day: 1918 AJS (built originally for the Russian army), 1910 FN, 1909 Triumph, 1915 JAP, c1914 Elliott, 1913 Douglas.